With the weather finally reaching below 80 degrees a week of rain ahead of me, it's finally starting to feel like fall. I know it gets a little annoying when it seems like all bloggers can write about lately is that itch for fall, but I don't care. I'll join the masses. All I want right now are sweaters, tights and salted caramel white mochas. 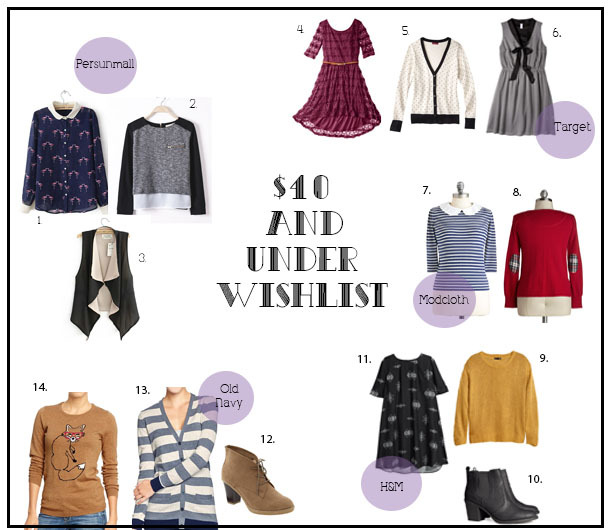 Unfortunately, my budget won't allow me to buy every cardigan in existence, so I thought I'd put together a little (very poorly and quickly-made) wishlist full of inexpensive things. My only question is, why aren't that Old Navy fox sweater and that H&M dress in my hands right now? Oh my gosh, I want everything on this wishlist. Especially the fox sweater, like you said. Such cute picks! My favourites are 7,9 and 14! Oh I'm wishing for fall too. I'm never annoyed by people wanting it to be cooler outside because I basically wish that 80% of the year! All of these picks are so cute. I want all the sweaters/cardigans too. I understand. I recently visited Target.com and oh my do I want everything there! They're dresses are so so cute! Love this wishlist! Love all of these cute sweaters!